Just had a wee look at the Monster Hunter Wikia & I think it'll be fine as the Japan only release of MH 4 (4th generation) had 51 monsters overall with 14 of them being new (3 were new sub species) & with World being the 5th generation I can see them going for a similar approach. They've already announced 7 monsters all in so I'd say it's looking good. This has been announced to be coming out on January 26th & we have a fancy new TGS trailer too. That is much sooner than I expected it to be and has me a bit sad that I'll have even less time with MHXX, all the new monsters look fantastic though and story wise it seems like it will follow the 4U approach except with voiced cut scenes. What's crazy though is this is before TGS fully starts where they said they will be announcing something new each day for MH world. This comes out at such a bad time and same happened this year when we seemed to have got a lot of Japanese release at the start of the year Now already I would like this, Ni No Kuni 2, Final Fantasy Dissidia NT and Lost Sphear but my birthday is Jan 28th and like last year I can ask for some for it (yet to play some of those games). 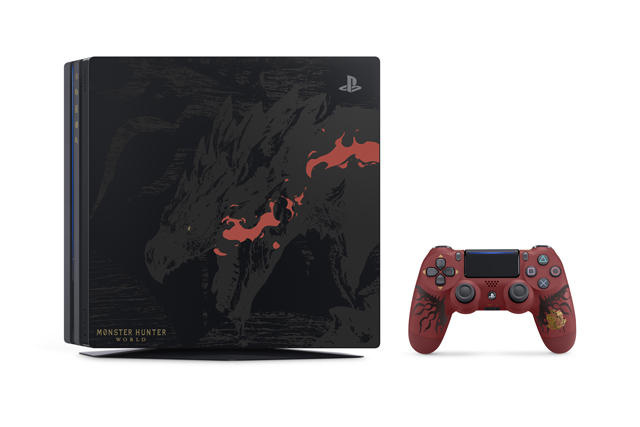 It'd be nice if that Rathalos ps4 comes out over here as well. What's crazy though is this is before TGS fully starts where they said they will be announcing something new each day for MH world. I think I'll go on blackout if they're going to be talking about new things every single day. The inclusion of a story mode is news enough for me - I was sold pretty early on anyway - so I'd like everything else to be a surprise now. Aye that's fair enough, I'd try it myself but it'd be real hard with all the MH folk I follow on twitter and sub to on youtube. If any big news is revealed I'll be sure to spoiler tag it if I want to discuss it on here. It just be nice to have a special edition Pro (which the MonHan one is) over here which isn't just a white one. Absolutely love that you can now track the materials you might need for weapon/armour upgrades without having to go to the smithy, I remember MH Tri on wii had something a little like this that when you carved a needed item a little jingle played & this looks like they've expanded upon on that idea. The ability to reverse a weapon upgrade is also a nice addition but the best thing for me is how the more you use the scout flies on a monster the more the research level goes up & you can then get useful info of certain weaknesses etc to view in game. RIP MH wiki. I'll read about quality of life upgrades - I was more meaning in regards to new monster reveals and things of that ilk. That monster weakness feature is so good. I hate having to find out what monster is weak to what element, which usually results in me bringing along whatever will do a big chunk of damage over anything else. Good stuff! Ahh I see, now I might be totally wrong here but I can see that being it for new monster reveals and the rest just being returning monsters. Also the more I see game footage the more I don't mind seeing the damage numbers either & I honestly thought I'd be turning this feature off instantly but it's so useful especially if you are playing a gunner type weapon. Do you reckon we'll get a demo for this? I know Capcom usually put one out but I wonder if Capcom would rather ride the hype wave and have people buy the full game rather than have new players potentially turned away by trying before they buy. That's a tough one as MH doesn't really demo well for new people & with all the new stuff I'd say it's even harder to show folk what they're getting into, I also get the feeling the demos were something Nintendo suggested to them. Surely Capcom don't need to make demos for Monster Hunter any more? I mean, I don't know if demos are a big thing on the PS4 digital storefront and could help them make some extra sales, and that... but the game's target audience must know about it by now. It's like when Terry Pratchett complained in an interview that he always had to explain the premise of Discworld to journalists (and therefore their audience) - the multi-million selling Discworld series, that is. Well world is meant to be expanding the audience, we on here and likely watching TGS coverage know what it is but Joe Public who sees a cool trailer during Half Time of Champions League game might not know what it is but a demo could help. As Jas was saying through, a demo could hinder it too. I don't think I'd have enjoyed the MHGen demo at all had I not had the Monster Mash lads there to talk me through it. We're also getting a BETA on PS4 which is the 9th-11th of Dec, you will need Plus as it is part of that for members. Hyped and I hope to see you all on the BETA. 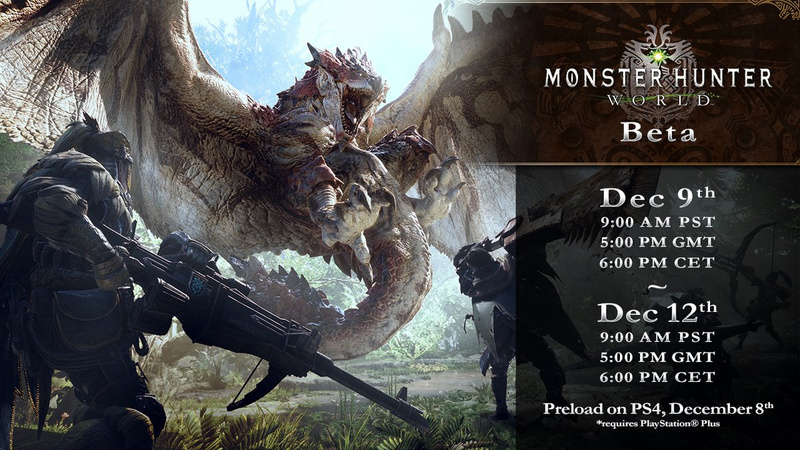 Aye having a beta is great news, the beta will have 3 monsters (Great Jagras, Anjanath & Barroth) meaning we get to explore two areas: the Ancient forrest for the first two & the Wildspire Waste for the last one. Talking of areas the new trailer showed off the Rotten Vale & a bunch of new monsters along with it. Gaijinhunter also does an analysis of the new trailer. A real shame you are missing out on this beta. A nice wee blog post from director of the game telling you 6 things you need to know for the beta. The training area sounds awesome! I think I'll spend a good wee while in there deciding what my weapon of choice is going to be for World. Downloaded the BETA and played all three hunts by myself (I think looking who was on Jess took the 4th spot) and the QoL elements such as even the handler made a real difference along with the trailer at PSX showing the story elements. All those things make me want to be in the games world and have a purposes of the hunts. I could possibly pick this up when it comes out (I'm not around for the Beta), but I'd want to make sure that I can get in on the multiplayer action. I picked up both the prior 3ds MH games but couldn't get them online (damn student wifi ). This is a version that'd actually be possible for me to play online though!